November in Ramat Handaiv, Israel and I am once again working trails at the reserve, searching for butterflies. Once again I am startled to come upon wildflowers that I’ve never seen before. Yes, Cyclamens are known to me as flowering plants that are offered in flower shops and garden centers. It seems to me that they have been purchasable in the last 10 years? But these were not Johnny’s Garden Center offerings, these were wildflowers. The first I’ve ever seen in habitat. So of course I stopped and marvelled and debated: Should I or shouldn’t I work to get a good image of these sweet treats? As almost all of you know, I reliably lose that cranial debate when the wildflowers are eye candy. These were so. So esthetes all, Cyclamens. 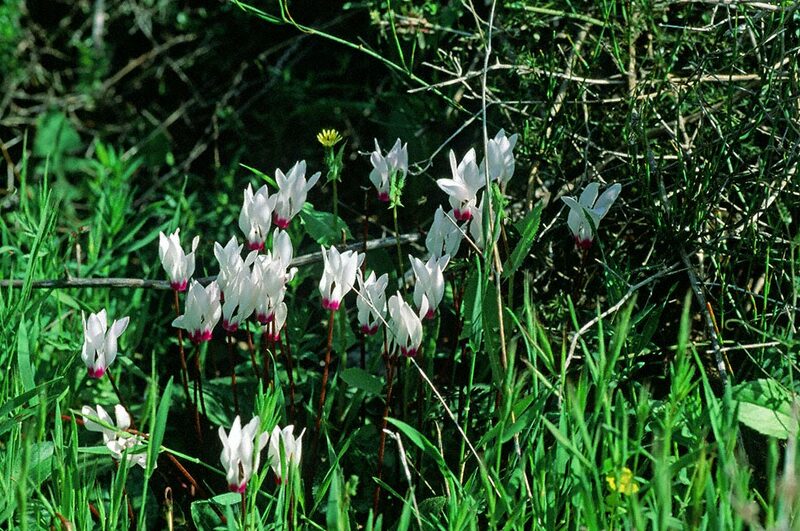 There was another population of Cyclamens that morning at Ramat Hanadiv. They were pink ones, and neither attracted butterflies. Footnote: None of the numerous Cyclamen plants that I saw showed any damage. None were eaten or tasted by herbivores. Does anyone have an explanation? On the lookout for Swallowtails, Fritillaries, Vanessa (Red Admirals & Painted Ladies), etc., I was doing what I usually do, avoiding the smaller, quicker and especially difficult to identify Skippers (Hespertinae). 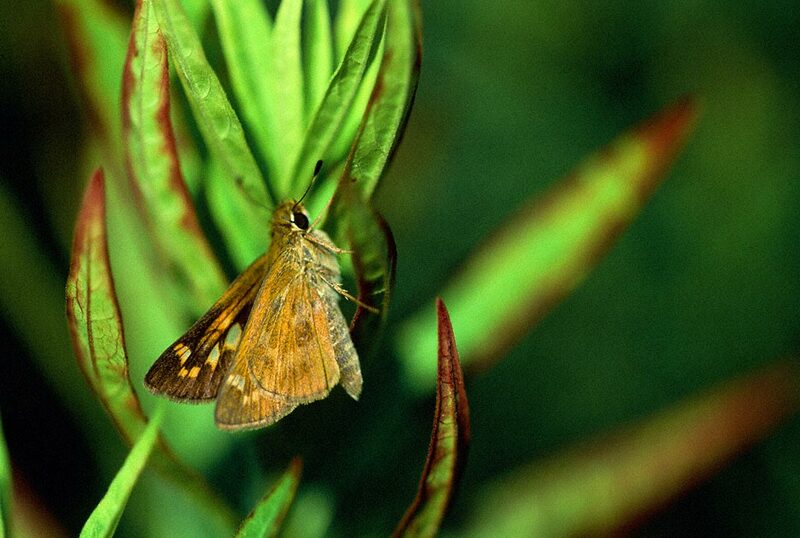 Skippers are of many species, many species that closely resemble one another. Distinct species that have no difficulty identifying their genetic material or mates, but present real challenge to those of us who, field guide in hand, attempt to identify them. Fiery, Black Dash, Sachem, Long Dash, Peck’s or Hobomok? Perry Mason would have too much fun cross examining someone who testified that a Sachem did it! So unless we are joined by authoritative NABA or Xerces folks, our female here is a Atalopedes Campestris. She joined me as I worked the Eastern Neck National Wildlife Refuge‘s Butterfly Garden, but didn’t stay long though. My approach interrupted her brief stop to rest. All on a mid-August morning. Skippers are all about what the yelling is about. Their diversity is real, with hundreds of species of butterflies in the U.S. All, including this one, count. All, including those like this one, must remain here and about. Meadows in the northeastern U.S. are generally barren in March through May. Late May through June brings quick growth of meadow plants and grasses. July finds these meadows with growth as tall as 3 feet high. Photographing summer butterflies is a rewarding experience. The monarchs, fritillaries, sulphurs, coppers and the list goes on and on. August comes with footnotes. Consider the usual party poopers: ticks, mosquitoes, deer flies and horse flies. What a gallery of rogues! A whole industry of commercial sprays and ointments are available to keep them from feeding on us! To this August list we add yet another meadow possibility. You follow a Monarch or an Aphrodite fritillary, working to get a good image of its vivid form. It flies from trail’s edge into the nearby meadow. You follow it. A short distance into the tall wildflowers, and “Uggggh!,” you are covered in spiderweb! No matter how many times that has happened to me, in an instant I revert to the boy in me, dreading that the giant Argiopoe aurantia AKA Black and yellow argiope spider is somewhere on my face, neck or clothing. Fact: For all the times that I’ve had this experience, I have never found one of these sizable arachnids anywhere on me. Could they be as displeased with being near us as we are being near them? wingedbeauty.com posts this image with a grasshopper caught in the silky protein thread of a web. That day in August, and in fact for that week, I stationed myself at these webs in a meadow in Rector, Pennsylvania. This female argiope had an especially well positioned web. Butterflies didn’t fly into her trap that morning. This grasshopper sprung into the web. I am not certain of its species, but I was ready. I had my Canon camera set at multiple clicks of shutter. The moment that the grasshopper contacted the web, I repeatedly pressed the shutter button, getting rapid groups of 3’s: pop, pop, pop! The argiope here continues to loop her sticky threads around her prey at very high speeds. After circling the grasshopper about 10 times, she pauses and then charges the trapped animal, digging her fangs in and releases potent venom. The venom soon renders the grasshopper helpless. Spiders of the meadow contribute to maintaining butterfly populations. They are a part of the phenomenal mechanism that annually returns new generations of butterflies to our meadows, forests, wetlands and other diverse habitat. Was this uncomfortable for some of you? Take a moment then to note how cleverly designed the spider is. What say you? Is she not breath-taking? It’s mid-morning in August, at the Eastern Neck National Wildlife Refuge. Two hours from Washington, DC and eye-pleasing no matter in which direction we turn. The butterfly’s orange-red markings near the forewing apex signal that she’s a looker. The camera lens registers her beauty and provides her the same extra something that it does for top models. Limenitis arthemis astyanax in Pennsylvania spend most of their time on the ground, nectaring sparingly. Those here on the Delmarva Peninsula behave differently each morning, flying early in the morning and spending a great deal of time working the perrenial flower beds of the Butterfly Garden. Interesting. Again, the absence of significant wing damage in these National Wildlife Refuge butterflies was difficult to dismiss. Why were they so free of evidence of having barely escaped predators? The mornng was a pleasant temperature. There was no wind. The sky was blue. The raptors occassionally flew overhead, Dave was working the Butterfly Garden and the butterflies were for want of a better word? Beauties. 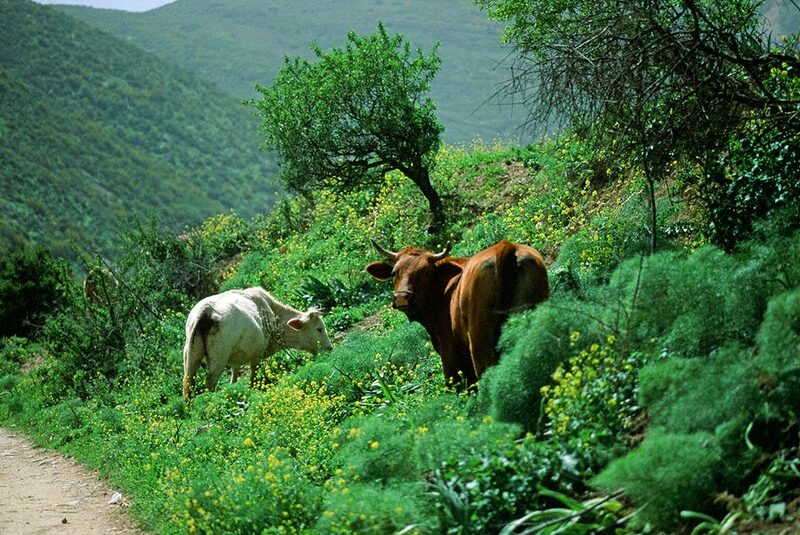 March in the northernmost Golan, Israel. As most of you know, as we worked our way down this trail, within a mile from the Israel/Lebanon border. 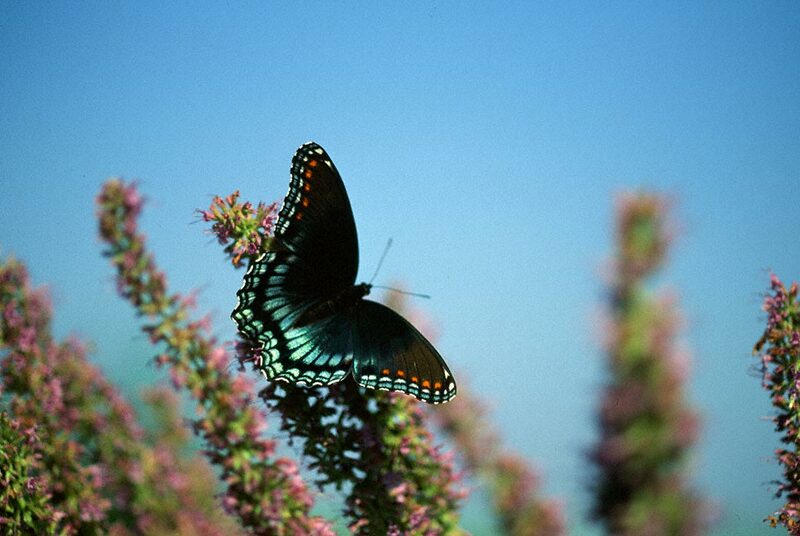 Butterflies were abundant, and protected species of wildflower were in bloom. Nirvana! The rule is the rule. Most of the time, the trail that you hike is the very same trail that you return on. So here, we reached a valley, with a stream running through it and began our ascent back up the trail to the trailhead. More butterflies, mostly hurtling up the trail in the same direction that we were going. We saw wildflowers that we hadn’t noticed on the earlier descent. Fine. Then, there they were: 7 or 8 huge cows were also working the trail. They were slowly grazing in the lush growth on both side of the trail. To our right, there was a sheer drop.To our left, we saw the sharp climb that almost begin at trail’s edge. As you can see, the cattle lazily looked up at us, or didn’t. Our approach didn’t seem to mean much to these 1,500 pounds behemoths. Although my Hunter College career advisor reported to me that my likes/dislikes best matched those of folks in agriculture, I am from Brooklyn, New York, then Long Island, also New York and now Pittsburgh. Rachel, nearly the same, with Georgetown, D.C. and Binyamina. So our choice was sit and wait as they blocked the trail, or do the serpentine thing and work between them. No cattle handler anywhere to be seen. I was OK with that plan, after what my college advisor had said. Rachel took a few moments to buck up her resolve and we worked our way between the cows, who at three feet seemed more like elephants. Back on the trail for butterflies!